Edinburgh Capitals have signed Great Britain Under-20 forward Duncan Speirs, from National Ice Hockey League champions Solway Sharks. Speirs, 19, becomes the third highly-rated Scottish prospect to join the Murrayfield men, following the arrival of Aaron and Caly Robertson earlier this month. 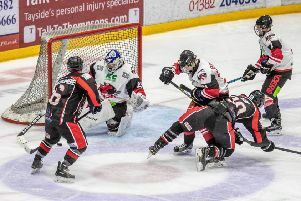 Through the Capitals’ academy programme he will train full-time with the Elite League squad, a level of hockey familiar to Speirs after making his debut with Braehead Clan as an 18-year-old and scoring one goal in two starts. Speirs has represented GB Under-20s for the past two years, and Caps’ co-owner Scott Neil, who has first-hand knowledge of the Irvine-born player through coaching him as part of the Scotland U-19 set-up, believes the time is right for Speirs to focus on Elite League hockey after averaging more than a point a game in the NIHL last season. Speirs said: “I’m looking forward to joining the Caps this year and working with the coaching staff to develop my skills. “I started at Kilmarnock where I played until U-16 level, then joined the Solway Sharks, and I appreciate all (Sharks head-coach) Martin Grubb has done for my development.